In a sign of what may come next, the Justice Department recently put a former prosecutor from Mueller’s team, Brandon Van Grack, in charge of the unit that enforces the 1938 law known as the Foreign Agents Registration Act, which governs lobbying efforts on behalf of foreign governments and foreign political clients. K Street is on notice, and lawyers and lobbyists say the FARA unit is already pursuing new cases that have not yet been made public. On Capitol Hill, Republicans and Democrats are considering a rewrite of the 81-year-old law, including giving the unit more authority to investigate possible violations. “The increased focus on FARA is not a flash in the pan,” said Joshua Rosenstein, a partner at Sandler Reiff Lamb Rosenstein & Birkenstock who focuses on foreign lobbying law. “The addition of someone of Mr. Van Grack’s résumé is a very clear signal to the regulated community that the department, at least informally, appears to be having a change in tone, if not in policy,” he said. The Justice Department has long treated the foreign agents law, which has always carried criminal penalties and is part of the national security division, as primarily a disclosure statute. It pursued only seven criminal prosecutions in the 50 years before 2016 when the department’s inspector general issued a report finding that enforcement of the statute had been lax. The department did not arrange an interview with Van Grack, despite multiple requests. A spokesman, Marc Raimondi, provided public data and confirmed Van Grack’s title as chief of the FARA unit and deputy chief of DOJ’s Counterintelligence and Export Control Section. “They may be less willing to negotiate,” said Rosenstein, who like other specialists in this kind of law has seen an increase in interest from clients and potential clients. Lawmakers who offered bills in the last Congress to revamp the foreign agents law say they are planning to bring them up again, potentially with some changes. Iowa Republican Charles E. Grassley and California Democrat Dianne Feinstein are among those in the Senate looking at the measure, while House Democrats gave the Justice Department’s FARA unit new authority in their ethics and voting overhaul (HR 1). Louisiana Republican Mike Johnson led an effort in the House last year on a bipartisan bill to overhaul the foreign agents law. The House Judiciary Committee approved the bill, but GOP leaders never scheduled it for a floor vote. Johnson said he’s planning to reintroduce it in the current Congress and has discussed the effort with Grassley, who sponsored the Senate companion. He said he plans to make some “tweaks” to the legislation before unveiling it. Johnson said that exemption “has been exploited by some bad actors,” adding that he expected the prosecutions would continue, even though Mueller has closed up his operation. 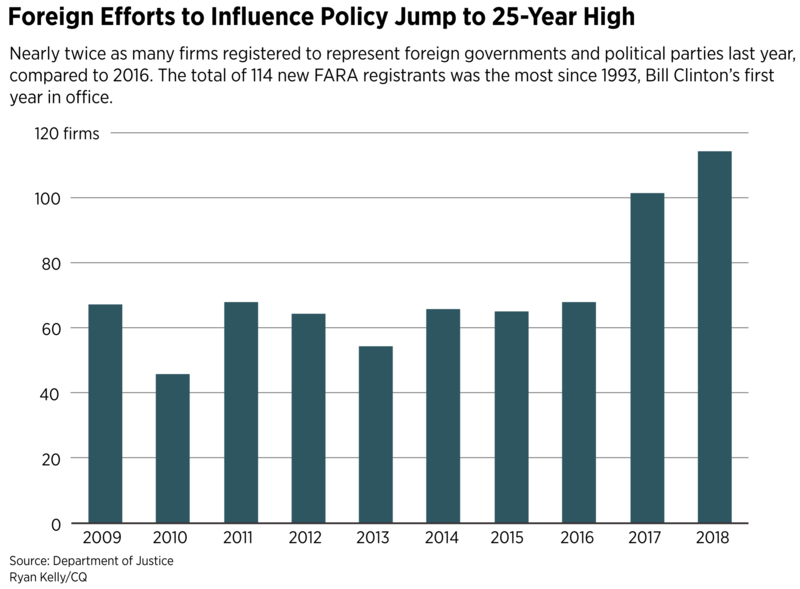 “I think it’s likely that legislation to reform FARA will move sometime in the next few years, though it’s very unclear whether it will move this year,” said Robert Kelner, a partner at Covington & Burling who leads the firm’s election and political law practice. Kelner said the biggest problem with the foreign agents law, from his perspective, is that it is vaguely written and subject to interpretation. It’s a concern echoed all along K Street: If the Justice Department is going to step up its criminal prosecutions under the law, then lawmakers ought to more precisely define it. “The whole entirety of the Russia scandal has consistently highlighted the need for this law to work,” said Lisa Gilbert, vice president of legislative affairs at the liberal group Public Citizen. “My sense of the law is it is fairly clear, and it’s much more of a problem of lack of attention to it by bad actors than a real need for change” in how it’s worded. The shift in focus to the foreign agents law came even before the special counsel probe. The Justice Department’s IG report in 2016 certainly brought attention, too. But the risks for not complying with FARA have increased dramatically. The law firm Skadden, Arps, Slate, Meagher & Flom recently paid $4.6 million to settle its involvement in the Manafort case. Its former partner, Greg Craig, a onetime White House counsel in the Obama administration, may still face charges. “I’m hopeful that the changes we’re seeing, particularly the public advisory opinions, will help shed more light on what’s expected of the regulated community,” Minor said. He said the uptick in interest in the law has spurred questions from clients and potential clients as never before. Though lobbyists have long been familiar with the system, public relations executives, think tanks and other nonprofit organizations may not realize their own exposure under the law. “Even if they qualify for an exemption, it’s important to know precisely why that’s true,” Minor said. They believe DOJ may already be poised to narrow the Lobbying Disclosure Act exemption, in practice, so that some companies would need to register under FARA if a foreign government or political party is “a” principal beneficiary, not just “the” principal beneficiary of the lobbying effort. “I think that it opened everyone’s eyes to how much different foreign governments tried to influence our political discourse in a covert manner,” Demers said, according to a Reuters report of the conference in New Orleans. Nicholas Robinson, legal adviser for the International Center for Not-for-Profit Law, said he’s been monitoring the changes to FARA as well as the proposals emerging on Capitol Hill. “We are obviously concerned if there’s ramped-up FARA enforcement because the act is so broad,” he said, potentially ensnaring nonprofit organizations that receive foreign funding. Registering under the foreign agents law, he added, “has a stigmatizing effect. You’re labeled literally a foreign agent, so it undercuts the independence of nonprofits.” Some organizations that are based abroad could decide to suspend their policy engagement in the United States rather than register under FARA, Robinson said. Indeed, foreign-based nonprofit organizations that engage in advocacy campaigns here are the most likely to find themselves subject to the foreign agents system. But even those based in the United States with significant international funding and work might also get roped in. There’s also the potential that political and policy disagreements could enter into the mix of how DOJ enforces the law, some experts warn. Last year, for example, House Republicans — including Utah Rep. Rob Bishop, then chairman of the Natural Resources Committee — sent letters to environmental nonprofit organizations, including the Natural Resources Defense Council and Earthjustice, suggesting they may need to register as foreign agents; those groups pushed back and are not registered under FARA. Bob Deans, NRDC’s director of strategic engagement, said at the time that the group was working in the U.S. public interest even when advocating abroad in places such as China.